This section is about our mask collection and the stories behind new masks. Many years ago, when we moved into our current house, I contemplated how to decorate a problematic wall. After months of deliberation, I decided to start a mask collection to document our family trips. The kids were very little then, and we haven’t yet gone to many places. But both my husband and I loved traveling, and we had a long bucket list of places we wanted to visit. I thought that a wall of masks would be a nice memento from all those future trips. Over the years, this proved out to be one of my best decor ideas. For one, it eliminates the need to buy other kinds of souvenirs while traveling (though we sometimes do anyway). Furthermore, finding the right mask became a fun family pursuit, one that requires family cooperation. We all have to agree on a mask before we purchase it, which often necessitates some negotiations. We usually try to get the most “authentic” mask we can put our hands on (even though we know,deep down, that this is an illusion). Whenever possible, we prefer to buy a mask directly from its creator. We value those the most. When this isn’t an option, we try to get one from a local source, such as a store that sells locally-made handicrafts. Often, though, we have to settle for less. A few times we even settled for a lot less, and returned home with cheap Chinese-made mass-produced souvenirs. Once home, our mask is a nice visual reminder of the common experiences we just had. Each mask has its own story, be it the story of the mask itself, or the story of how we found it. Slowly, these stories are woven together, integrating themselves into the bigger tapestry that is our family’s story. The increasingly more-crowded mask wall is a visual manifestation of our common adventures. It was only natural, therefore, that we hunted for masks on our recent trip to Cancun as well. 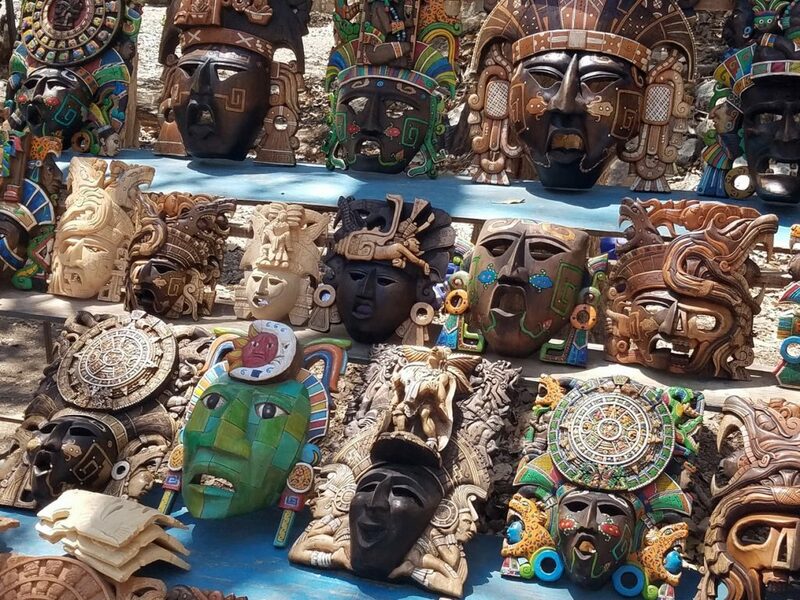 Although our resort hosted a mini Mexican craft fair, and although we visited a nearby tourist bazaar, we decided to get our mask in Chichen Itza. That was our way of trying to bring some of the magic of this Mayan wonder into our home. I mentioned last week how disappointing many of the souvenir booths at the site were. After seeing a few of them, all with the exact same things, all with the faint air of a Chinese factory hanging over them, we began to despair. We asked our guide if there was any authentic booth anywhere around. He told us he knew just the one, and took us to a little booth in a not-so-central location. 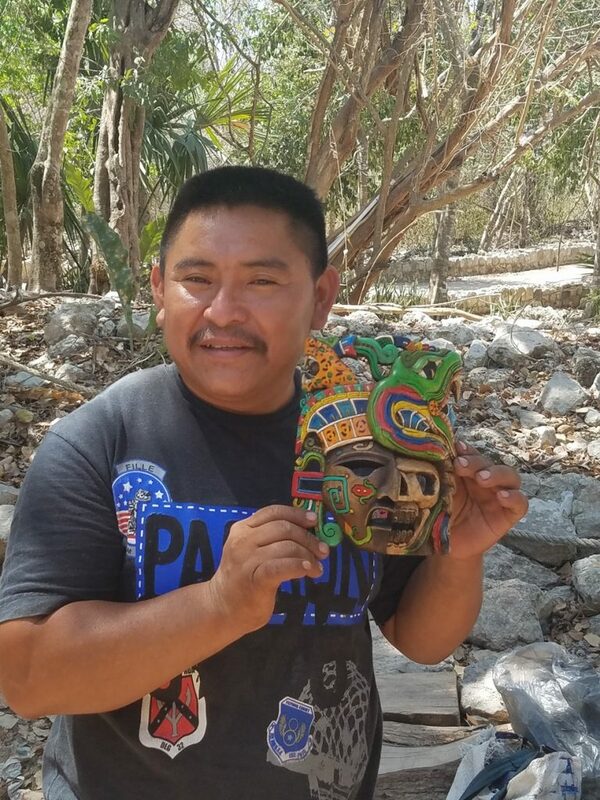 There, he introduced us to Efrain Cetz, a mask carver. Some of the pieces looked freshly made, and were still unpainted. A few were quite simple, while others were incredibly elaborate. Some were small, others very big. Efrain himself spoke very good English, and was happy to explain the different designs and the symbolism behind them. Of course, we wondered whether our guide simply took us to a friend, or whether he got a cut of the profits. 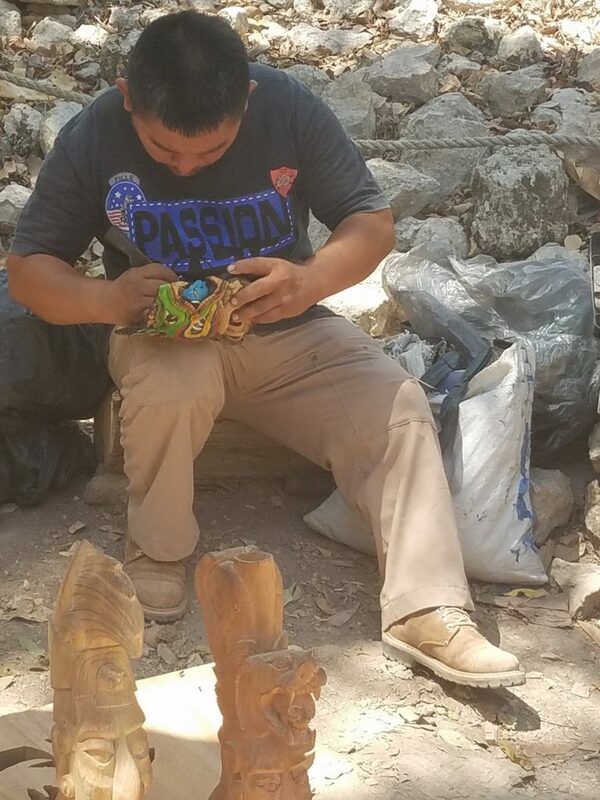 We also wondered how Efrain had time to carve so many masks when he needs to spends many hours every single day selling them at Chichen Itza. His English was so good, that he felt more like a salesman than a mask carver. However, these masks did look different than those presented at other booths, and they did look hand made. We really wanted to believe, and Efrain was really good at selling stories. We found our booth. Choosing a mask took a while. 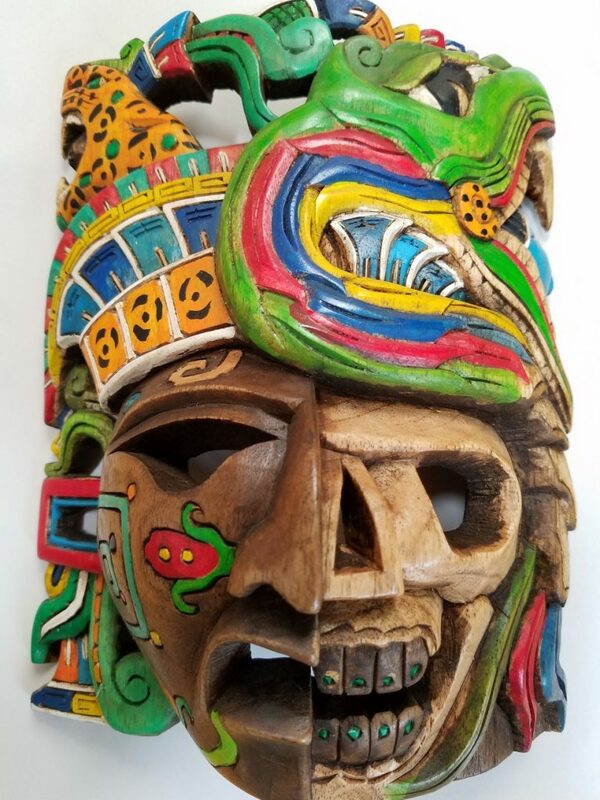 The kids wanted one that was half-face half-skull, the Mayan way of expressing the fusion of life and death. I wasn’t so sure about the half-skull part. It wasn’t something I wanted to stare at every day. Finally, though, I gave in. The story of the Mayan mythology was too compelling. Besides, the mask had both the serpent and tiger gods carved into it. The city of Chichen itza was a monument to both of these gods, so it felt right. Once home, I discovered that Efrain has a Facebook page, and that other tourists found him as well. Some even documented his work on Youtube. We will certainly cherish his mask as one of our more authentic ones!